In Starbound, traveling from planet to planet is done via interstellar ships. These ships are different for each starting Race; there are a total of seven ships, one for each race. Interacting with the captain's chair will bring up the Navigation Console, which allows the player to set a ship's destination. Player-specific planetary homes may also be set via the Navigation Console, then returned to from anywhere using the teleporter. After repairing the ship, Fuel is required to activate the FTL jump drives in order to fly outside the local solar system. After a destination has been reached, the ship will remain in orbit until directed to a different location via the Navigation Console or directly via the Coordinates system. Ships can be used as a home base, containing storage and crafting apparatuses that follows the player from planet to planet. Developing a customized ship layout that works for the player is part of the game; the back walls, the door, the lights and such can all be safely destroyed and replaced if the player chooses to do so. After repairing the ship FTL drive players will open a variety of missions that will allow them to upgrade the size of their ship. These quests are given at the outpost. See the Ship Upgrades page for a detailed breakdown of what the upgrades look like, how much they cost, and what they unlock. The shiplocker is a storage container where players can store items on their ship. By default the shiplocker has 64 inventory slots. The fuel hatch is how players can refuel their ships. It will break down Crystal Erchius Fuel and Liquid Erchius Fuel to fuel which refills the ships fuel gauge and allows it to travel. These resources can be gathered on moons. Traveling to planets within the same solar system has no fuel cost. The teleporter is used to travel to and from a ship. You will appear in the teleporter when returning to your ship or when teleporting to another player's ship. You also have the option to warp to different locations, if you placed a flag or teleporter bookmarks. The SAIL Station is the main interface for your ship computer which provides missions and is also used to view and manage crew member details. See Ship Upgrades for details on expanding to larger ship sizes. The Apex starter ship is ultramodern, with a smooth, streamlined shape and elegant electric lights. It looks the most futuristic of the available ships at launch. Or a space shuttle. When fully upgraded the Apex ship has 3,730 blocks, being the second smallest ship. The Avian starter ship resembles the ancient theme of the race, even appearing to be powered by a large red crystal which is seen frequently in Avian Villages as torches. When fully upgraded the Avian ship has 3,762 blocks, making it second largest ship. The Floran starter ship has design influences from other races' ships. The reason in rooted in Floran lore, which defines the race as scavengers, stealing technology from other races. When fully upgraded the Floran ship has 4,013 blocks, making it the largest ship. The Human starter ship looks very militaristic, with a flat gray color and red accents. When fully upgraded the Human ship has 3,752 blocks, making it the median ship in terms of size. The Hylotl starter ship resembles a large fish. When fully upgraded the Hylotl ship has 3,450 blocks, making it the smallest ship. The Glitch starter resembles a castle with turrets and a (non-functional) cannon. When fully upgraded the Glitch ship has 3,735 blocks, making it the third smallest ship. The Novakid starter ship resembles an old steam locomotive, to fit with the race's wild west-themed culture. The ship contains a small deck on top, but it is inaccessible. It was added after the other six racial ships in update. When fully upgraded the Novakid ship has 3,760 blocks, making it the third largest ship. Rampaging Koala. This is a large-scale ship whose textures are currently in-game, but has not fully been implemented. The ship contains a bridge, factory, hangar, creature laboratory, docking room, engine room, bar, sickbay and a viewing deck. The original Hylotl starter ship. The original model for the Hylotl ship was completely different from the current one; while the current ship only vaguely resembles a fish, the original Hylotl ship was blatantly a large koi fish, complete with scales, fins, and an eye. The lighting inside the ship was provided by five Traditional Paper Lanterns, keeping in line with the stylistic theme of the race. 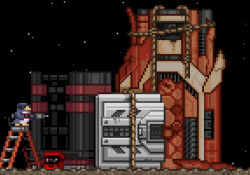 The back half of the Hylotl ship. 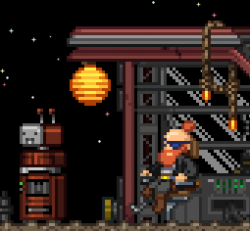 The back thruster of the original Hylotl ship can be found at the outpost near Penguin Pete's Vehicle Lot in a pile of ship parts along with a Hylotl lantern hanging from the main part of the shop. According to the Starbound Chronicle, powering up the ship's FTL drive in the atmosphere causes a massive explosion on the planet, but the ship survives. When you start travel to next planet/system, you can see (when sitting captain's seat) "Timestep - 2.0" This means, you fly 0,5 of light speed. As of 1.3, it is now possible to see both Player and NPC ships as white ship icons on the Navigation Console, NPC ships being the only ones able to be interacted with however. This page was last modified on 26 August 2017, at 03:26.